We flew in on a humid evening into Bangkok, a city that you either hate or you love. Internationally famous, this is the metropolis that never sleeps, full of crazy energy, spicy food, and whether you’re thirsty for a pub crawl, curious about the lady boys’ infamous night show cabarets, or want to indulge in some retail therapy at the mega malls, there is something for everyone. 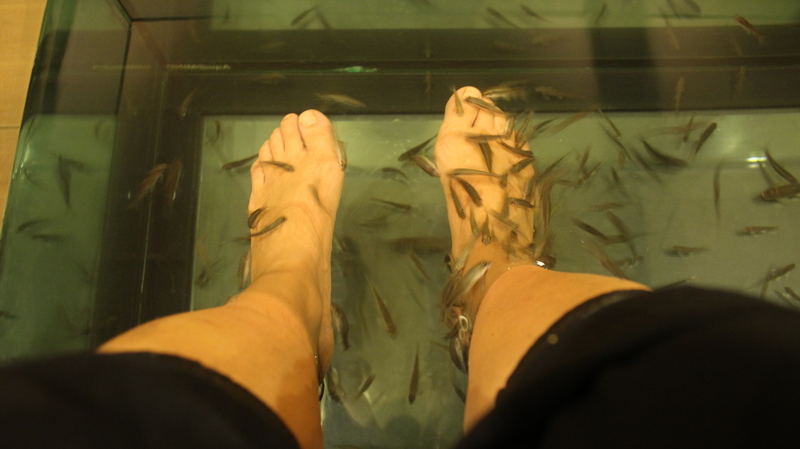 It is in Bangkok that you can eat like a king and and have fish nibble at the dead skin on your tired feet. With so much royal treatment, there’s even a gilded palace to stroll at your leisure. 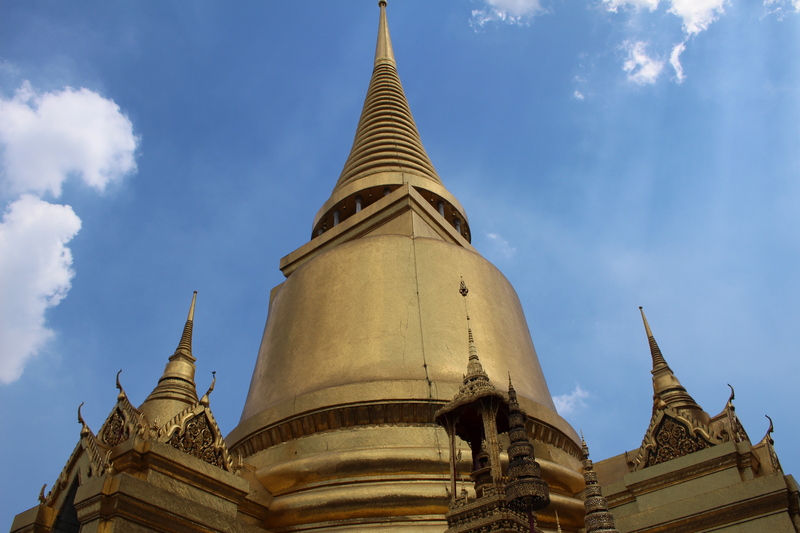 No matter how short your stay is in Bangkok, you better have The Grand Palace on your agenda. 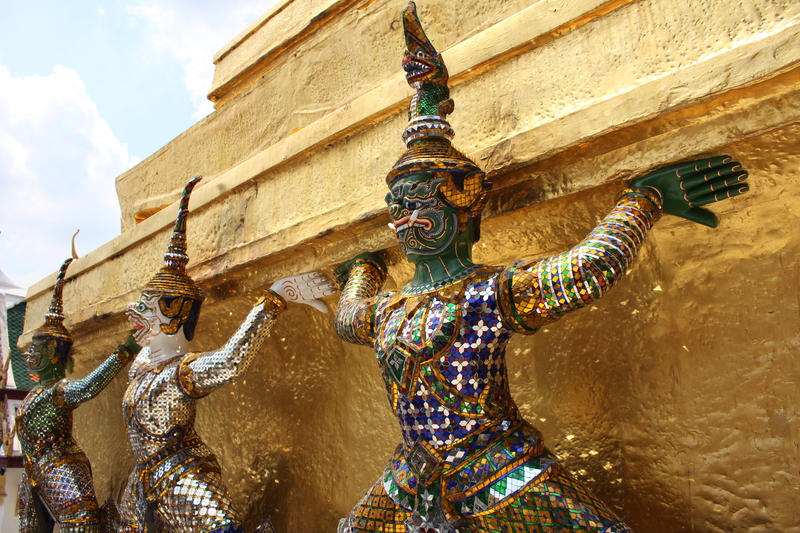 Comprised of over 30 buildings, including golden stupas, gilded statues, grand courtyards, temples, and halls, there’s enough gold to make King Midas jealous. 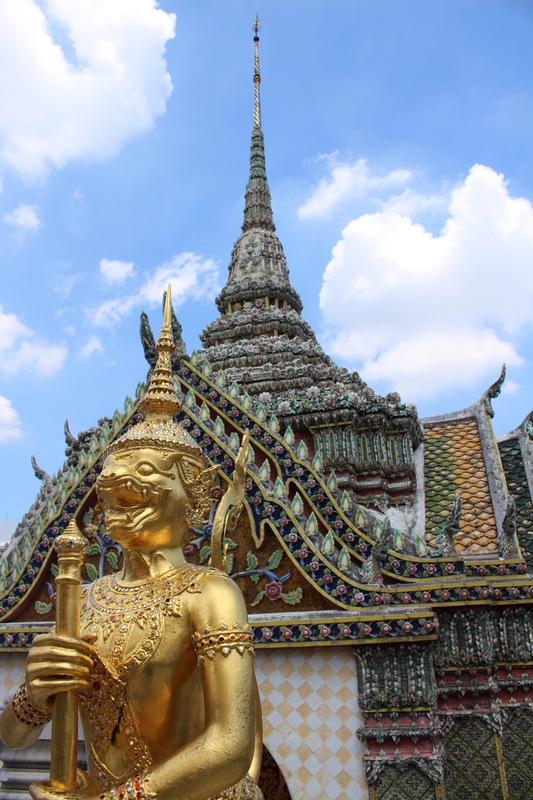 Once exclusive only to the Kings of Thailand and his royal government, The Grand Palace is now one of Bangkok’s most visited tourist attractions. There are dozens of tour groups that frequent the royal grounds, and it is impossible to take a photo without one, two, or a dozen photobombs behind and next to you. Still, Simon and I decided it would be worth it to rub sweaty elbows with fellow tourists just so we could be kings for a day. 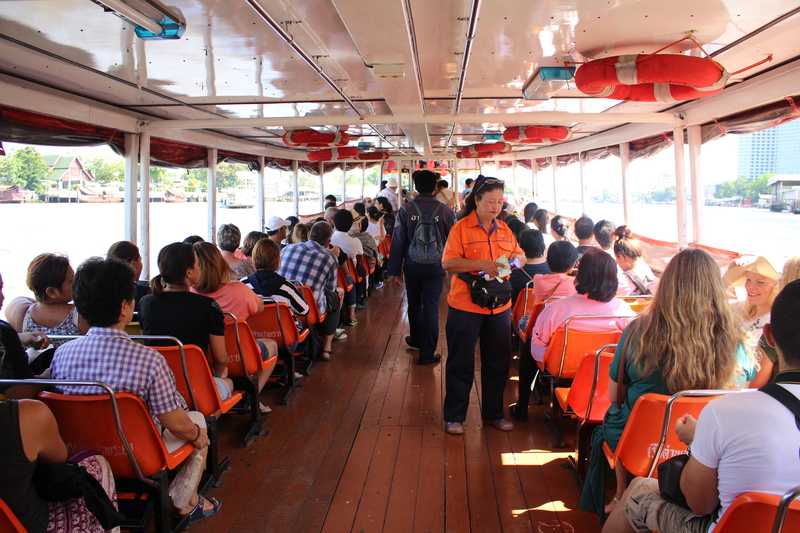 Depending on where you stay in Bangkok, there are several ways to get to The Grand Palace. Our hostel was located in the popular Sukhumvit area, making it easy to hop on the Skytrain Metro and get off at the Saphan Taksin station, next to a ferry terminal on the Chao Phraya River. 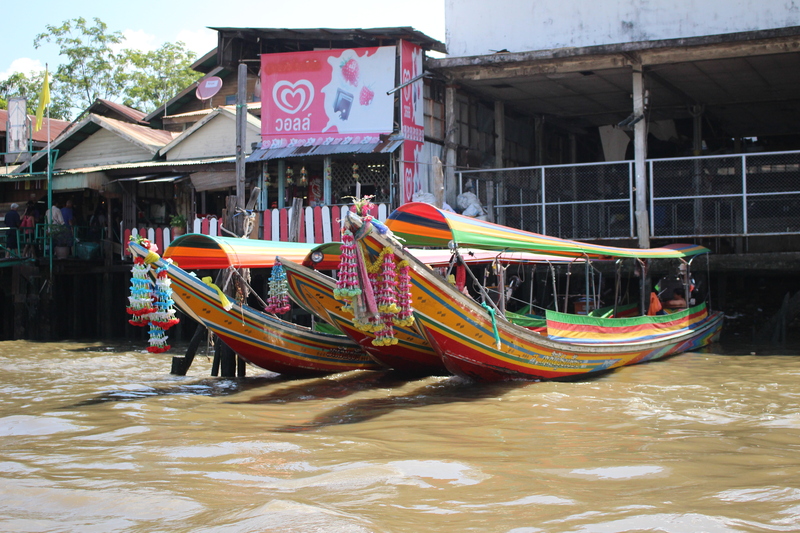 Once aboard the commuter ferry that was filled with tourists and locals alike, Simon and I steadied ourselves, as the boat pulled away from the dock, rocking sideways and bobbing up and down on top of the choppy murky waters. The ticket lady was shouting out something in Thai, while at the same time rattling what looked to be a rain stick filled with coins, that also doubled as a ticket dispenser. Small bills of the colorful Thai baht were organized in folded stacks between her fingers as she made her way to passengers that had just boarded the boat. Simon gave her our fare, which she deposited into the tube of change, and in return, from her change stick she ripped a small strip of paper that was to be our ticket. 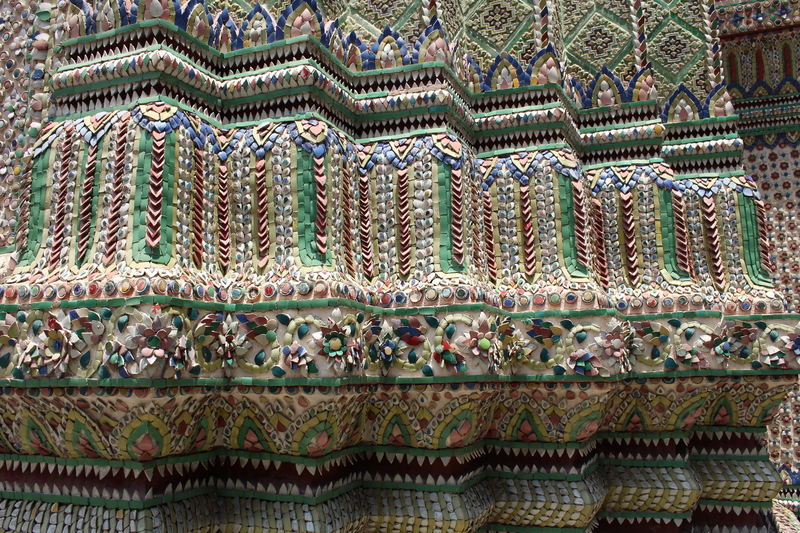 Many of Thailand’s temples require a dress code forbidding bare shoulders, tight clothes, or short hemlines. For the indecently dressed tourist, the temples often loan smocks, skirts, and pants free of charge during your visit. Having done our research beforehand, Simon and I arrived fully clothed despite the stuffy humidity that plagued the city. We whizzed by the inspecting officers at the entrance, but I almost wished that I disobeyed the dress code, so that I could borrow a colorful sarong with beautiful Thai print and blend into my surroundings. 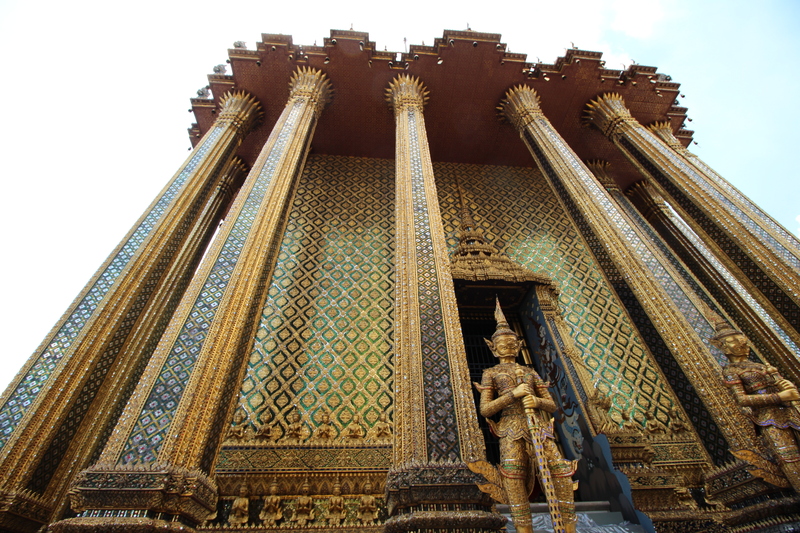 Setting foot into the Temple of the Emerald Buddha, one is awestruck by all things gold and gilded. 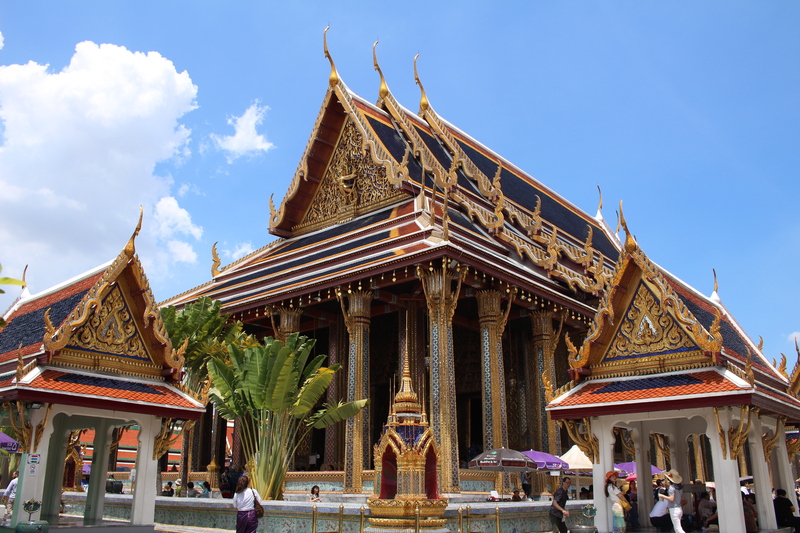 It is the most sacred temple in Thailand and the main reason why visitors flock to The Grand Palace. Larger than life statues, pointed spires reaching the heavens, and grandiose temple halls all vie for your attention. Between the massive golden stupa on the upper terrace on our left (the Phra Siratana Chedi), and the actual Temple of the Emerald Buddha itself to our right (the Wat Phra Kaew), Simon and I didn’t know where to begin, except to take in the golden scene of the courtyard in its entirety, complete with the tourists that were all abuzz around us. The royal grounds are expansive and I marveled at not only the sheer size of the stupas and high columns around the temples, but also the dizzying layout of buildings that seemed to clash yet also mesh together seamlessly. 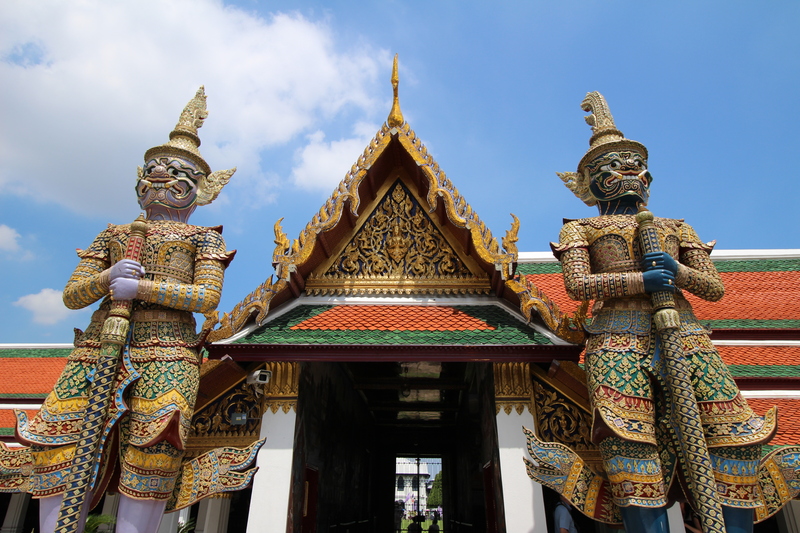 With every pavilion and courtyard we passed through, we glimpsed into a sliver of Thailand’s history, with each cluster of buildings revealing the contributions of each successive king that ruled the country. Intricate details, symmetry, and repetition seemed to be a constant theme that covered all surfaces, making for incessant admiration from both afar and up close, inspiring the inner photographer in me. 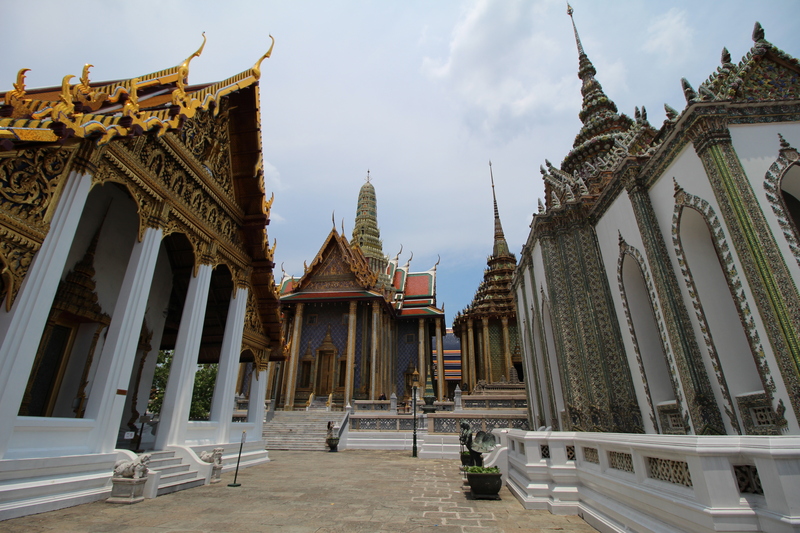 Walking barefoot around the outside of the Temple of the Emerald Buddha, I admired the row of identical golden statues that lined the exterior, laid over ornate raised reliefs behind it. The walls and columns were covered from the floor to the sky high ceiling in mirrored tile mosaics that reflected a fragmented reflection of my own face filled with an expression of wonderment as I gazed upon them. Simon and I quickly became spoiled by so many photo opportunities, and it didn’t take long until our eyeballs glazed over with such excessive extravagance. Being kings for a day is easier said than done. After a busy day of promenading through the complex, Simon and I ended the evening at a fish spa, tickled funny as little fish nibbled at our royal feet.